One of the first factories to produce American-made toothbrushes was the Florence Manufacturing Company established in Massachusetts in 1866 as a maker of various household brushes. 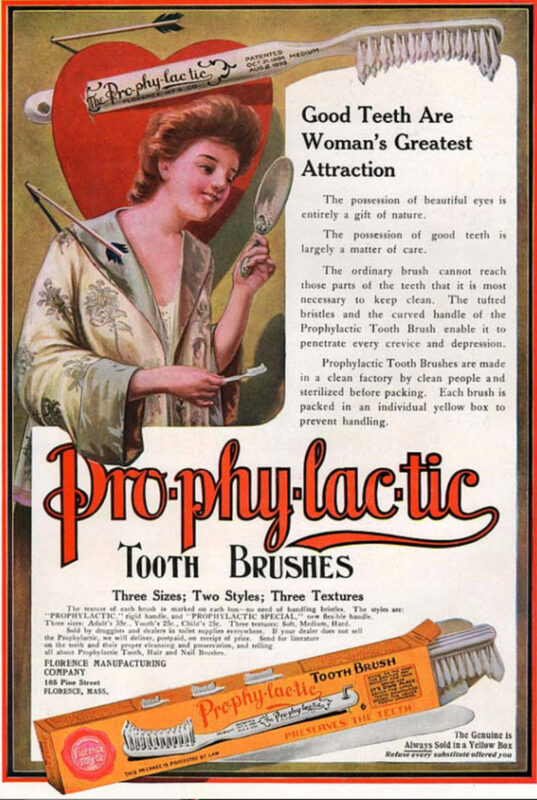 In 1888 they began selling what became the popular Pro-phy-lac-tic toothbrush based on a patented design and trademark acquired from New York dentist Dr. Meyer L. Rhein. The toothbrush featured three rows of serrated bristles with longer end tufts. Distinctive traits included a concave head tapered toward the end and a handle embossed with a distinct number or symbol to help family members distinguish their individual brushes. A hole at the handle end, for hanging the brush to dry the highly water-absorbent, hollow bristles, discouraged bacterial growth and made the brush more hygienic. As the enduring toothbrush of choice, yearly average sales, encouraged by an annual advertising outlay around $500,000, reached 7.5 million from 1924 to 1933, and the brush remained in demand until the mid-1970s. Hyson, Jr., JM 2003 History of the toothbrush. J Hist Dent 51(2):73-80; Mattick, BE 2010 A guide to bone toothbrushes of the 19th and early 20th centuries. Bloomington, IN: Xlibris Corp; Segrave, K 2010 America Brushes Up, the use of marketing of toothpaste and toothbrushes in the twentieth century. Jefferson, NC: McFarland and Company; Wolf, W 1966 A history of personal oral hygiene — customs, methods and instruments — yesterday, today, tomorrow. Bull Hist Dent 14(4):54-66. "The possession of beautiful eyes is entirely a gift of nature. The possession of good teeth is largely a matter of care," proclaims this Victorian-era Pro-phy-lac-tic toothbrush ad (circa 1890). 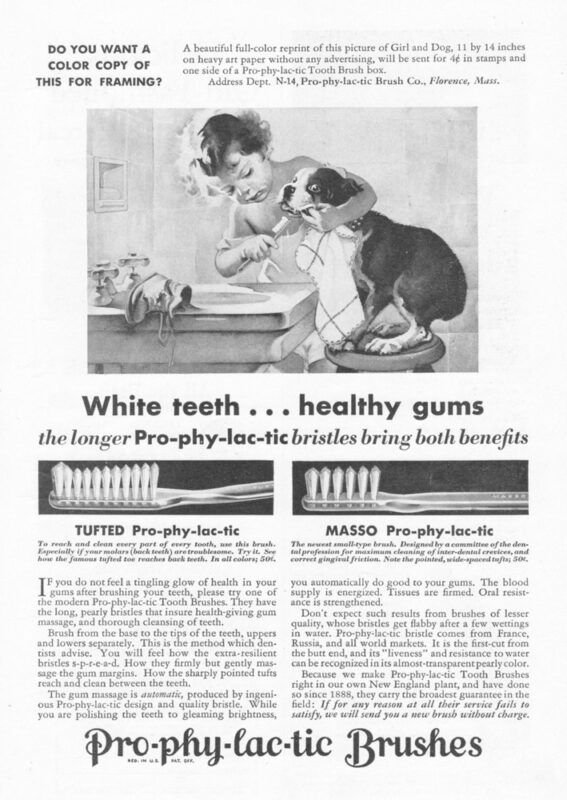 This Pro-phy-lac-tic ad from 1931 features a cute child attempting to brush the teeth of a dog who doesn't seem entirely sold on the idea.